Works great with any worsted weight yarn. Super easy project for a beginner lace knitter. If you can do a YO and a K2tog you have all the skills needed. Pattern knits up in an evening. 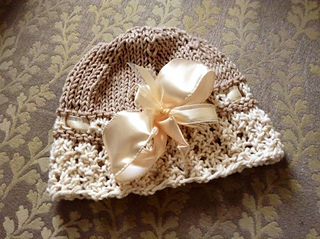 Pattern is adjustable for any size but basic directions are for a sixteen inch cloche. 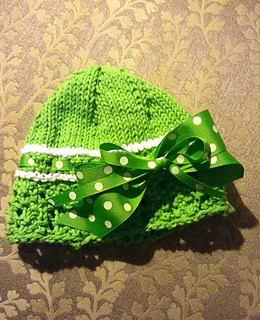 You will have this pattern memorized by the second hat! So fun to embellish! Size 7 16 in. circular needle and DP of same size. 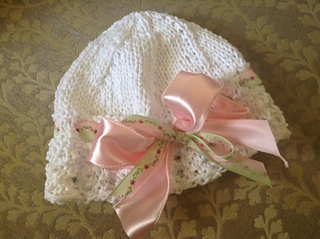 Weddings, baptisms, holidays, birth, give that special gift they will cherish forever.